First of all, let me say you have an awesome product portfolio, I like most of your products! When I select AI Clear effect for an image, the preview looks great, as intended. Then, when I apply the effect and get back in Photoshop, the result looks significantly different, less optimal, like if I would have used a completely different option. I tried almost everything to change this behaviour, to no avail: Use the standalone version of Topaz Labs Studio, save as 16bit, 8bit, TIFF, jpg… whatever, not change. Any idea what might have happened since the last update? Did you use the HD Preview button at all? It’ll look different in the HD mode alright - before you hit Confirm. Oh sure, I did also check that, but no difference. I see the clean picture in preview, but not when I apply the effect. Those artifacts look typical of those created by adjusting solid color areas, especially in JPEGs because of compression, so I would raise a support request using the Need Help link at the top of the page. Also I am unable to reproduce it but I only use CS6. Looks like a scaling issue to me. Look at the pixel-values in the left-bar. They don’t match with the resulting image, so maybe you are watching the preview at a scale that is not 100%? Why are the numbers on the vertical ruler only sharp on the ‘bad’ image? Did you export the middle-image with some kind of jpg smoothing or chroma-subsampling on? That can soften an image and perhaps make it look less noisy. I understand that you want all errors on my side excluded, but, be assured, I did everything to make the results comparable. All is 100%, not compressed in any way, fully comparable. The screenshot is done within PS CC, the middle picture of course is just a screenshot of the TS window, hence the different scaling, but it’s not blurred or something, it’s just grey characters, the right one has white characters since this tab is the active one in PS. I use Photoshop and lots of addins, here are some of my images. 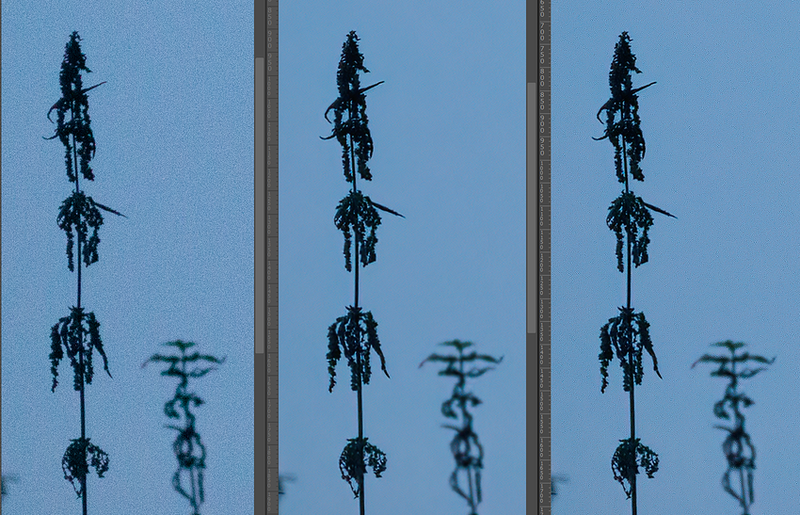 I rely on working tools and like AI Clear a lot, it provides stunning results, but in some cases I got these strange results that give me different results (and these are not subtle, these are absolutely obvious, so jpeg resampling can wipe this away). We have managed to correct the issue with Digital Frame, and I am personally looking forward to seeing it resolved in the other Adjustments impacted, as I see the artifacts from A.I. Clear in some of my own images, now that it’s been pointed out to me. It tends to happen with larger input images, as downsampling increases as your image size increases, making the artifacts more noticeable. My early investigations point to downsampling as being involved in the process, though not necessarily being responsible for, the introduction of these artifacts. 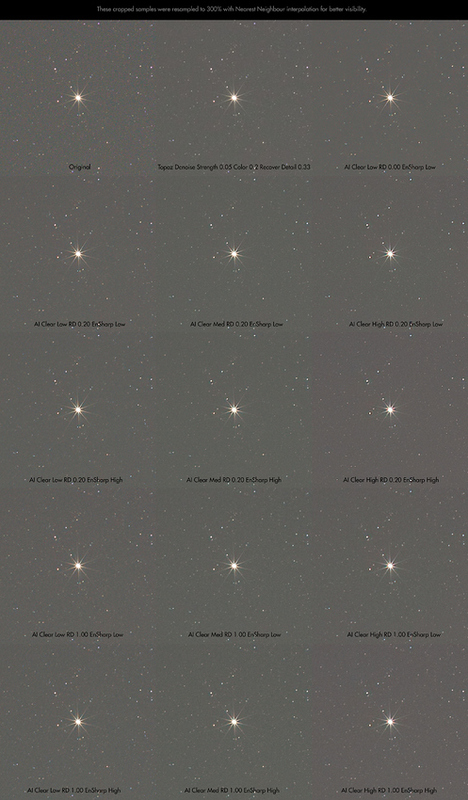 Update: Now that I watch this problem more closely, I can recognize the problem even in much busier images like e.g. in the woods… There you can especially experience that the detail recovering is working much weaker in the final image than it was in preview. May I ask if this issue is the source of the preview mismatch I’ve reported earlier here? Thanks! May I ask if this issue is the source of the preview mismatch I’ve reported earlier here? Your examples are pretty specific, but yes, it is possible they are related. Thank you for your prompt response! I shall patiently await the Topaz team to look into these issues. My hope is that these two new A.I. products would mature into wonderful tools that we professionals can trust to incorporate into their workflows. Happy Holidays to all at Topaz! I’m still having the same problem… artefacts in the saved tiffs that aren’t there in the Studio screen. Any progress or update?? There has been no change or update to this problem. procedure to final result calculation. Maybe I miss something. There are many reasons for this. We’re a small team, have many products, and many projects in the works. I cannot set priority on fixes, I can only report them to the developers. Thanks for your understanding! since it applies to almost all the pictures I process. I would ask you or someone from topaz to set the priority accordingly. Don’t rush out products that are not mature. The best we can do as a support team in situations like this is refund the purchase price and let you keep the license. So, that’s what I just did. You should get an email concerning the refund soon. I cannot set priority, nor do I have much influence on the schedule. All we do here is observe and report. Occasionally, there’s a configuration or usage issue we can address, but by and large, the people that respond to you directly are not in charge of the development schedule or product quality. We’re simply trying to react to our customers and support the product that was deemed ready for release by the company. Thanks!